Anglers joining us on their Bozeman fly fishing trip in 2019 will have a lot to look forward too. Our custom outfitting program in Bozeman for 2019 will include float trips, wade fishing trips, day trips, half day trips, and multi-day packages all with the hardest working Bozeman fly fishing guides around. Our home base in Bozeman is uniquely centered to give our anglers and fly fishing guides access to the greatest diversity of blue ribbon rivers, streams, and lakes in Montana. From the famous waters of the Yellowstone River, the Madison River, and the Gallatin River, to quieter waters more off the beaten path, our Bozeman fly fishing trips and guides allow anglers to experience the best fly fishing Bozeman has to offer. All of our Bozeman fly fishing guides utilize high-end drift boats and rafts to allow anglers to enjoy float trips on Bozeman’s larger rivers. Each of our blue ribbon rivers offers a unique character and diverse fly fishing opportunities for our anglers. Float trips are a great way for anglers of all skill levels to enjoy fly fishing in Bozeman, MT and expect to have fun and be successful. Our float trip offerings are always seasonally dependent on flows and fishing conditions, but you can reasonably expect for a variety of rivers to be fishable from April through November. Anglers that prefer smaller waters and a slower pace of fly fishing find our wade fishing trips to be a great part of any Bozeman fly fishing trips. From small mountain streams, to private spring creeks, our Bozeman wade fishing trips offer a wide variety of fly fishing for anglers wanting to enjoy wade fishing with our Bozeman fly fishing guides. Several of our wade fishing streams allow for hike-to-fish opportunities for anglers wanting to venture off the beaten path and enjoy an angling adventure. 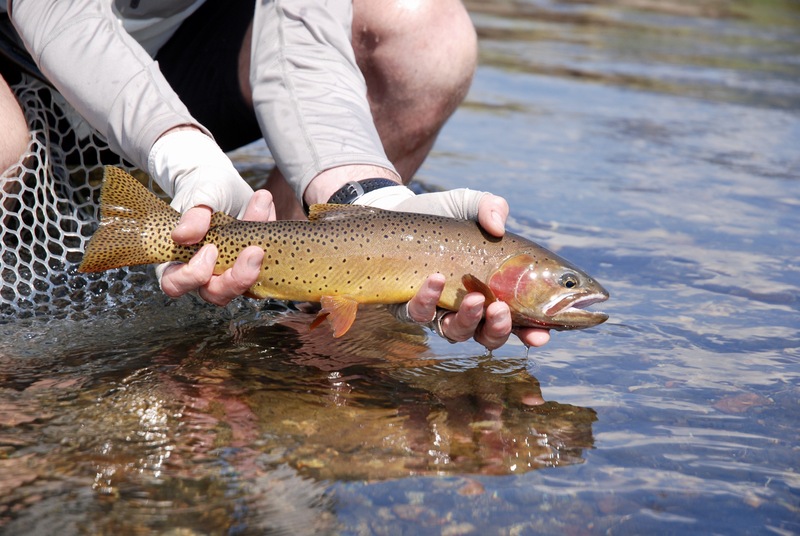 While often overlooked by many anglers, fly fishing the lakes around Bozeman, MT offers excellent fly fishing for often trophy sized rainbow and brown trout. Dry fly fishing and sight fishing can be outstanding at times, and lake fishing offers a slower pace of fly fishing, perfect for anglers wanting to add variety to their Bozeman fly fishing trip. Private water lake options offer anglers consistent opportunities at trophy trout, as do our larger lakes when conditions allow for boating on these often times exposed bodies of water.